The 4 competitors in the Dusty Rhodes Classic finals recently spoke to WWE.com. 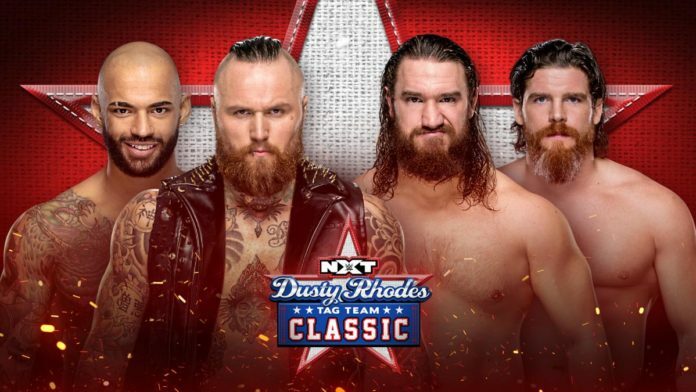 Next week on NXT will feature the finals of the 2019 Dusty Rhodes Classic. Aleister Black & Ricochet will take on Steve Cutler & Wesley Blake of the Forgotten Sons with the winner earning a title shot against the War Raiders. Ahead of next week’s finals, the 4 competitors spoke to WWE.com about Dusty Rhodes’ legacy in NXT. Cutler and Blake both trained under Rhodes before his passing in 2015. Blake is the only wrestler in the match to have competed in the tournament previously. Along with current Cruiserweight champion, Buddy Murphy, Blake competed in the inaugural version of the tournament. Aleister Black arrived in NXT after Dusty’s passing. The former NXT champion says that his legacy speaks for itself, however. Ricochet also commented on their opponents in the finals.